Many employers don't understand the law when it comes to employee leaves. If your employer denies your request to go on leave or retaliates against you for taking leave, you may be entitled to compensation. If you are having a problem with your employer on any employment issue, contact us to discuss your case and your options. Contact us or call 877-525-0700 for your Ventura County leave of absence lawyers. 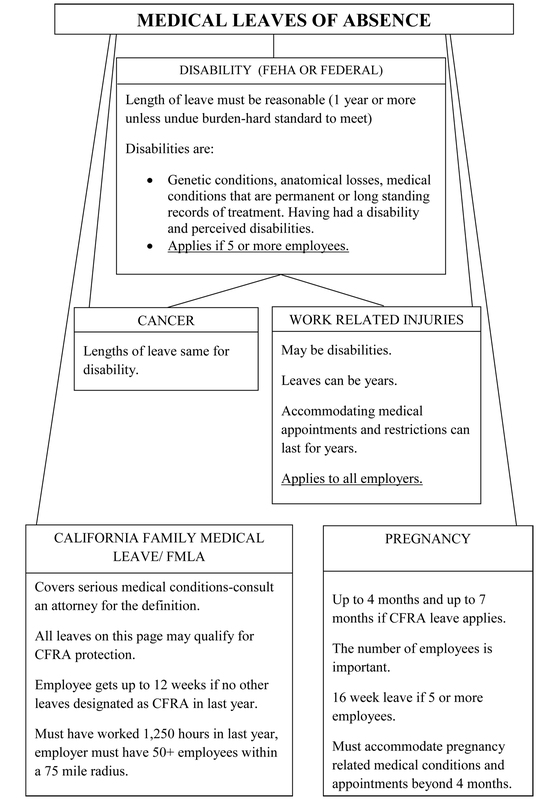 Medical leave to care for yourself or a family member DONâ€™T BE CAUGHT IN A BIND ASSUMING ONLY ONE LEAVE LAW APPLIES IN CALIFORNIA. CONSULT AN ATTORNEY AS TO WHAT LEAVE LAWS APPLY. Many employers are confused over the overlapping laws that may apply to an employee's leave. For example, in California your right to take certain types of leave may be protected by the Federal Family and Medical Leave Act and the California Family Rights Act. Since your company's human resources department may not be adequately trained, it's best to consult an experienced employment law attorney to determine your rights under the law. If you are eligible for leave, the law protects you from adverse employer actions for exercising your right to take leave. Examples of adverse employer actions include firing you, demoting you, not promoting you, or transferring you to a less-desirable location or shift. Contact a California Labor Law Attorney to see if you might have a case, call your Ventura County employment lawyers at 877-525-0700 toll free. We handle all cases on a contingency fee basis with no upfront costs. Se habla espaÃ±ol. If you need to take time off from work to recover from a serious health condition or to care for a family member who has a serious health condition, you are protected by a law known as the Family Medical Leave Act (FMLA). The California Family Rights Act is a California law that provides similar, but better, protection. If your employer has denied your right to take FMLA leave or had retaliated against you for taking leave, you may be entitled to compensation. Contact us to discuss your case and your options. We are one of the few firms willing to take employment cases to court in Ventura County. 877-525-0700 for a Oxnard Trial Lawyer. Many employers do not understand the law and end up violating the rights of their employees. Contact us to speak to a Ventura, California Family and Medical Leave Act lawyer, or call 877-525-0700 toll free. We handle all cases on a contingency fee basis with no upfront costs. Se habla espaÃ±ol. If you need to take time off from work to provide the direct care for certain family members or to recover from a serious health condition, you may be protected by a law known as the California Family Rights Act (CFRA). The Family and Medical Leave Act is a federal law that provides similar protection. If your employer has denied your right to take leave or had retaliated against you for taking leave, you may be entitled to compensation. Contact us to discuss your case and your options. Your employer is required to maintain and pay for your group medical coverage while you are on leave. Everyone is entitled to a leaves of absence. When you employer denies you in any way to take a leave of absence, contact a Simi Valley attorney to fight for your compensation. Serving all of Ventura County including: Agoura, Camarillo, Moorpark, Ojai, Oxnard, Santa Paula, Simi Valley, Thousand Oaks, Ventura, Westlake Village. Contact us to speak to a California Family Rights Act lawyer or a Bakersfield CFRA Attorney, call 877-525-0700 toll free. We handle all cases on a contingency fee basis with no upfront costs. Se habla espaÃ±ol.